Younger Western Europeans, defined in this study as those ages 18 to 29, tend to go online to get their news. 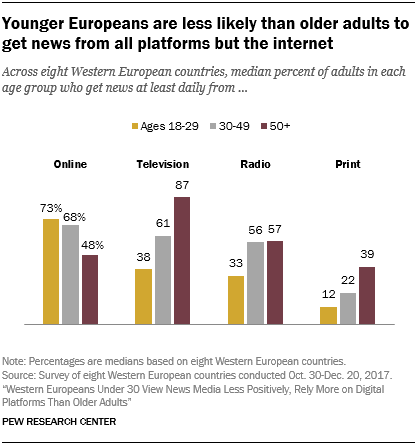 A median of 73% of 18- to 29-year-olds across all eight countries surveyed get news online at least daily, while they get news from other traditional platforms at lower rates: 38% get news at least daily from TV, 33% do from radio and 12% do from print newspapers. This stands in contrast to those ages 50 and older, who use television the most for news. A median of 87% in this group get news daily from TV, compared with 48% who do online. Adults ages 30 to 49 fall roughly in between the other two age groups for both television and online news consumption, with 61% getting news daily from TV and 68% getting it online. In six of the eight countries studied, fewer than half of those under 30 get news on TV at least daily. Italy and Spain are the only exceptions, where about two-thirds of younger adults get news from TV daily. TV news use among this age group is the least popular in Denmark, Sweden and the UK, where roughly a third of adults under 30 get news daily from TV. Few younger Europeans get daily news from print sources in hard copy – no more than 20% of those ages 18 to 29 do so in any of the countries studied, and as few as 10% do in the UK. The age differences in print news use are especially wide in Germany and Sweden, where adults under 30 are 44 percentage points less likely than those 50 and older to get news from print daily. Younger Europeans are also less likely than older adults to get news from radio in most countries. Among 18- to 29-year-olds in Western Europe, between 27% (in Spain) and 49% (in Germany) do so daily. Younger adults are less likely than the two older age groups to get news from radio daily in every country but Italy, where 41% of those ages 18 to 29, 56% of those 30 to 49, and 43% of those 50 and older say they get news from radio daily. Just 13% or fewer of 18- to 29-year-olds and 23% or fewer of 30- to 49-year-olds in each country say they never get news online. But in all eight countries, substantial portions of those 50 and older never get news online – from 22% in Sweden to 42% in Germany. For television news, the pattern is reversed. Up to 24% of those ages 18 to 29 say they never get news on TV, compared with no more than 5% of those 50 and older in any country studied. Among adults ages 30 to 49, between 3% in Spain and 15% in Sweden never get news on TV.